Get glowing, younger-looking skin with this trio of do-it-all multi-taskers from StriVectin®. The Multi-Action collection features high impact, ultra-modern textures that make it easy to have great skin. Moisture Matrix cleanser transforms from gel to oil to milk as it melts away makeup and impurities. R&R Eye Cream repairs and recharges the delicate eye area, targeting lines, wrinkles, dark circles, puffiness, sagging and dehydration. Multi-Action Restorative Cream is a luxurious, lightweight moisturizer that targets 12 key signs of aging – fine lines, wrinkles, density, firmness, sagging, texture, dehydration, dullness, discoloration, clarity, resilience and enlarged pores. Together, they’re your secret for a more youthful complexion. Moisture Matrix Melting Cleanser – tri-phase moisturizing cleanser transforms from gel to oil to milk. Contains nourishing botanicals like avocado, marula, sweet almond, grapeseed, dandelion, sunflower and rice bran, along with NIA-114™, a patented molecule for fighting the signs of aging. 1 fl. oz. Multi-Action R&R Eye Cream – repairs delicate eye area, targets lines and wrinkles, dark circles, puffiness, sagging and dehydration. Contains NIA-114, dual-action peptide complex and mimosa tree extract. 0.17 oz. 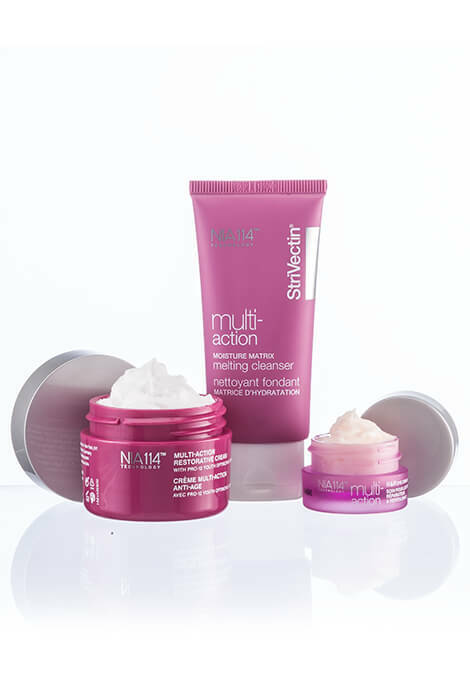 Multi-Action Restorative Cream – lightweight moisturizer that targets 12 key signs of aging. Contains NIA-114, palmitoyl tripeptide-5 and shea butter. 1 fl. oz. To use, gently massage onto dry skin in a circular motion as gel melts into an oil. Add warm water and continue massaging as oil transforms into a cleansing milk. Rinse and pat dry to reveal soft, dewy, nourished skin. Suitable for removing all makeup, including long-wear eye and lip formulas. To use, apply all over clean face in the AM and PM.